Over the past decade, The Global Risks Report has expanded its scope from analysing the interconnected and rapidly evolving nature of global risks to also putting forward actionable solutions and calling for public-private collaboration in strengthening resilience. Now in its 11th edition, the Report describes a world in which risks are becoming more imminent and have wide-ranging impact: tensions between countries affect businesses; unresolved, protracted crises have resulted in the largest number of refugees globally since World War II; terrorist attacks take an increasing toll on human lives and stifle economies; droughts occur in California and floods in South Asia; and rapid advances in technologies are coupled with ever-growing cyber fragilities and persistent unemployment and underemployment. Implications of sweeping digitization (also termed the “Fourth Industrial Revolution”), ranging from transformations that are the result of rising cyber connectivity to the potential effects of innovations on socio-economic equality and global security, remain far from fully understood. At the same time, climate change is unequivocally happening, and there is no turning back time. The increasing volatility, complexity and ambiguity of the world not only heightens uncertainty around the “which”, “when”, “where” and “who” of addressing global risks, but also clouds the solutions space. We need clear thinking about new levers that will enable a wide range of stakeholders to jointly address global risks, which cannot be dealt with in a centralized way. Taken together, this calls for a resilience imperative – an urgent necessity to find new avenues and more opportunities to mitigate, adapt to and build resilience against global risks and threats through collaboration among different stakeholders. By putting the resilience imperative at its core, this year’s Global Risks Report combines four parts to present an analysis of different aspects of global risks – across both global risks and stakeholders – focused as much on the search for solutions as on the analysis of the risks themselves. Part 1 analyses the difference in risk perceptions over different time horizons and the perceived interconnections among risks, as visualized in the Global Risks Landscape 2016, all based on the Global Risks Perception Survey, which combines the views of different stakeholders. 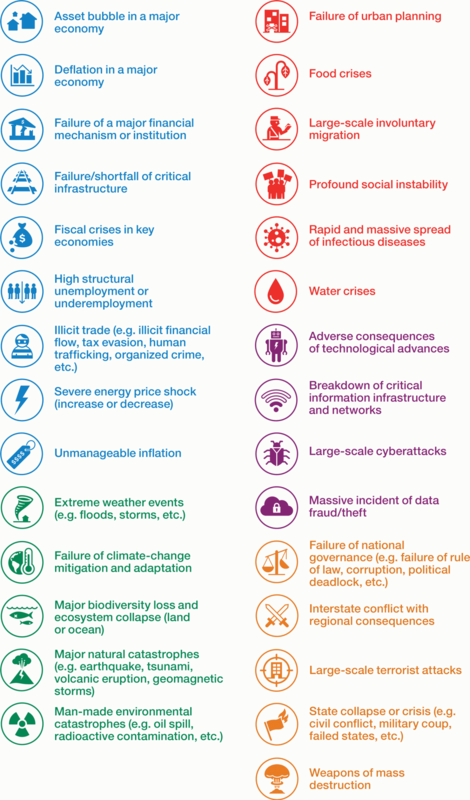 Three risk interconnection clusters stand out: climate change in relation to water and food crises; the growing challenges of the rising number of displaced people worldwide; and what the Fourth Industrial Revolution means in an era of economic risks. Part 2 discusses the implications of a changing international security landscape and identifies the drivers that are at work and the implications for addressing global risks. Inspired by the results of The Global Risks Report 2015 and the continued instability of the global security situation, it lays out alternative and plausible futures that could materialize unless there is a change in how we respond and manage the forces at play. 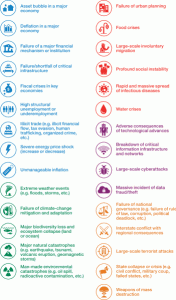 Part 3 explores three risks clusters that have the potential to challenge social stability. For each of these “Risks in Focus”, it describes three existing, practical initiatives that could help to build resilience. The concept of the (dis)empowered citizen is introduced to describe the tensions created by growing cyber connectivity that empowers citizens at the same time as they feel increasingly disenfranchised from traditional decision-making processes. The second contribution further explores one impact of climate change: coupled with rising population growth, it is threatening food security. Finally, in the wake of the Ebola crisis, the potential of pandemics to threaten social cohesion is discussed. Part 4 applies the resilience imperative to one specific stakeholder – the business community – with an analysis at country and regional levels. Drawing on a unique data set of more than 13,000 business leaders in 140 economies, it explores the differing landscape of global risks across regions and offers a deep-dive into five of the six most cited global risks worldwide. Its aim is to inform the discussion of which risks to prioritize in order to build resilience within businesses.